The FA will get an official translation before deciding what course of action to take. JOSE MOURINHO IS facing a Football Association (FA) investigation over comments he allegedly made on the touchline following Manchester United’s dramatic 3-2 comeback win over Newcastle United. Television cameras captured the Portuguese coach muttering what are reported to have been profanities in his native tongue as he headed for the tunnel following his side’s second-half turnaround, which saw them fight back from 2-0 down to take all three points. The FA confirmed on Monday that Mourinho will be investigated over the incident. 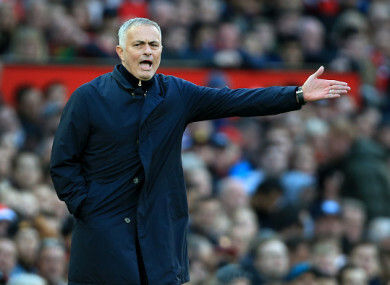 Mourinho, appointed United manager in May 2016, had been the subject of intense speculation in the build-up to the game with one UK newspaper reporting he faced the sack regardless of the result. Second-half goals from Juan Mata, Anthony Martial and Alexis Sanchez ensured United avoided a fourth Premier League loss of the season and Mourinho spoke afterwards about the effect of “the pressure of man-hunting” on his players. The visit of Newcastle followed a run of four games without a win in all competitions for the Red Devils, who suffered defeats to West Ham in the Premier League and Derby County in the EFL Cup during that spell. United’s next game sees them face Mourinho’s former club Chelsea in the Premier League at Stamford Bridge on 20 October. Email “Mourinho under FA investigation after allegedly swearing in Portuguese ”. Feedback on “Mourinho under FA investigation after allegedly swearing in Portuguese ”.